In 1813, Noah Speer chose this name for his little community on the Monongahela River. Later, his son Louis founded North Belle Vernon just up the hill. Every Christmas, North Belle Vernon is visited by Santa Claus in its Light Up Night because it is one of his favorite spots. 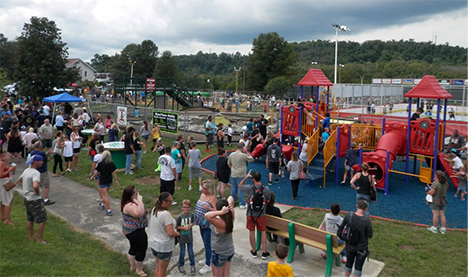 North Belle Vernon Community Bank Park, completely renovated and dedicated in August of 2016, offers lots of recreational opportunities for children and folks of all ages. In addition to the playground, there is a soccer field and dek hockey court and adult exercise classes are offered in the park. The Community Bank Park also puts on the annual Light Up Night, Halloween parade, and other fun events. 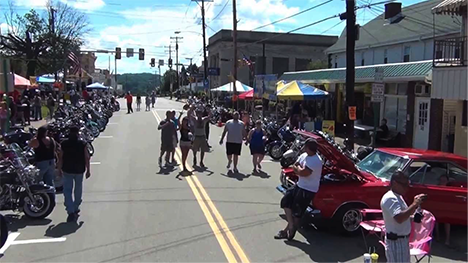 North Belle Vernon holds its popular annual Block Party, Bike Run, and Car Show on Broad Avenue, sponsored by the Fire Department and offering something for everyone. This section of the Monongahela River doesn’t carry an official water trail designation but it has been scouted and a map and guide was created in 2013. Click here to download the map. Click here to download the guide. Located between North Belle Vernon is the town of Belle Vernon, located in Fayette County, which has direct public river access, most easily by way of Smitty’s Marina, which has a restaurant, bar, and often live music. Interstate Route 70 connects the two towns and crosses over the River at the Belle Vernon Bridge to the town of Speers.